I think we all know people who are way too “into their game”. These are the people who have a near-unhealthy obsession with board games like chess, backgammon, or even Scrabble. For that last example, the hard-core Scrabble player might want to check out the Franklin SCR-226 Official Scrabble Players Dictionary (3rd edition). This device can definitely come in handy when players dispute if a word is valid, as it can resolve over 100,000 different words. It can also help a Scrabble player when making his or her next move. 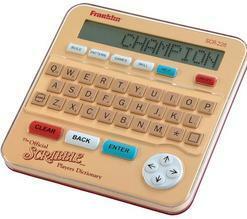 All a player has to do is enter in the seven letters that he or she has on the scrabble tile keypad, and the Players Dictionary will come up with several words for his or her turn. It will sort these words out by point value, and it can even find words from the letter pattern on the board. I don’t know about you, but I would not feel comfortable using this in any Scrabble game. It would be like letting an athlete use steroids to improve their sport. In other words, this Players Dictionary definitely gives the side using it an unfair advantage. If both players use it, then it is like two computers programmed to play against each other. However, if you have no such objection, and want to improve your Scrabble game, then you can get the Official Scrabble Players Dictionary on the Buy.com site for about $49.95.